Olympiakos striker Michael Olaitan has returned to full training with his side for the first time since he collapsed during a league game in March. The 21-year-old has been out since he lost consciousness during a 3-0 defeat by Greek rivals Panathinaikos. He was taken to hospital for tests and club doctor Christos Theos initially said a viral infection was to blame. Doctors carried out several further tests over the last months to ensure the Nigerian was in good health. "All the players were involved in the full training session, Olaitan also trained with the main group on Thursday," the Greek club confirmed on their website. Olaitan, who played for Nigeria at the Fifa under-20 World Cup in 2013, has expressed his relief at his recovery and said he feels "happy with his progress". "I'm beginning to feel my body responding. 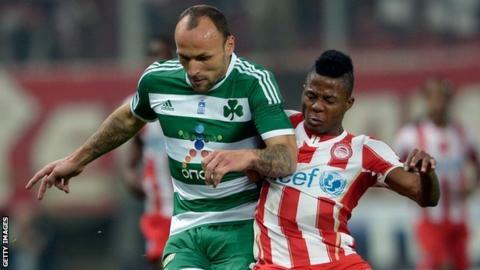 I feel great but will take it one step at a time," Olaitan told the Olympiakos website. "It's very important that I try and be patient, but I'm really happy with my progress." Olaitan won a football reality show in Nigeria and played for local side Mighty Jets before his move to Europe. He enjoyed a remarkable debut season at Olympiakos, playing a total of 16 games and scoring eight goals. The highly-rated Olaitan was tipped by the local media to make Nigeria's provisional 2014 World Cup squad before his setback in March.